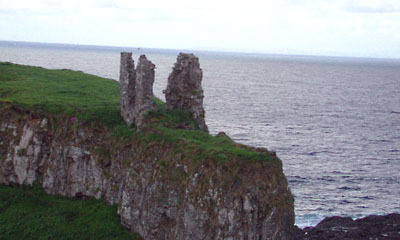 A little further east on the B146, we almost missed what little remains of Dunseverick Castle. 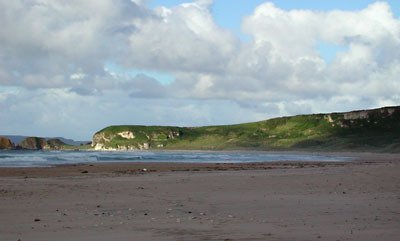 Shortly after the B146 merged back into the A2, we stopped again to go for a walk on the beach of White Park Bay. 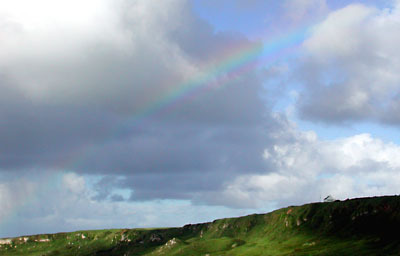 We were greeted by a rainbow. 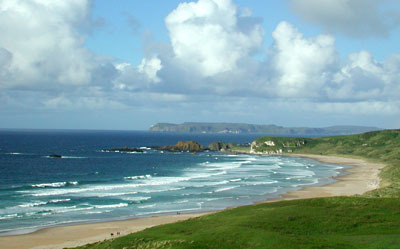 The island visible on the horizon in the following picture is Rathlin Island, located about six kilometers off the north Antrim coast. 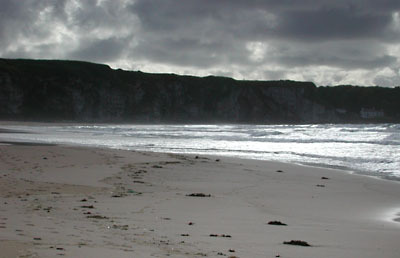 It is inhabited by about 100 people and thousands of sea birds. After making it back to the car before the next rain shower, we followed the A2 a little further to our last stop for the day. 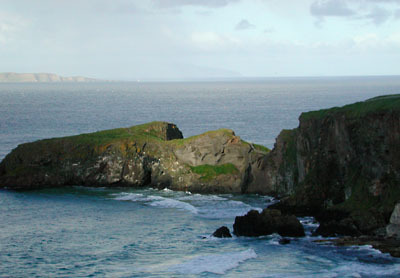 Carrick-a-rede means "the rock in the road" and refers to a small rocky island on the coast, blocking the path of salmon travelling up the coast. 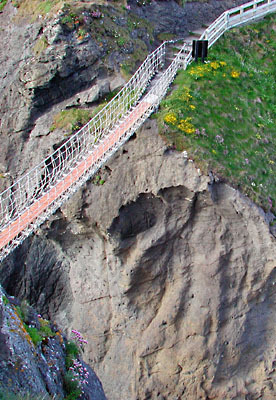 A 20m-long rope bridge connects the island to the main land. 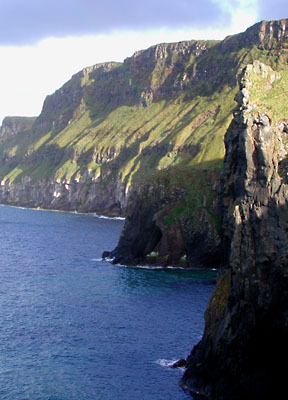 If you look closely, you can make out the rope bridge in the following picture, about one third from the right margin. 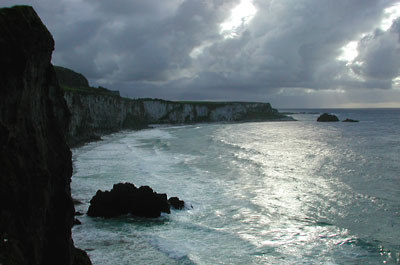 Clearly visible on the horizon on the left is again Rathlin Island, about six kilometers away. 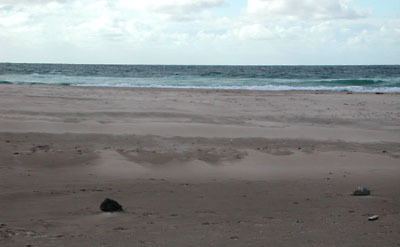 Barely visibile in the center of the picture is Scottland’s Mull of Kintyre, about 35 kilometers away. 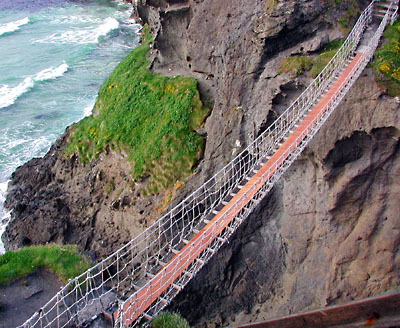 Unfortunately, the bridge itself was closed, presumably due to the strong winds, so we were spared the excitement of crossing over onto the island on a swinging bridge about 25 meters above sea level.